Check In to the Dead Mountaineer’s Inn | annie's got a clue . . . 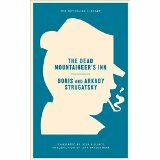 I had long heard about the Strugatsky brothers’ mystery, The Dead Mountaineer’s Inn. It has a cult-like following in Russia. The Strugatsky’s are the kings, the Tsars, of Russian sci-fi. But I just didn’t want to wrap my head around reading the mystery/sci-fi mash-up in its native Russian (something I could do, but chose not to devote weeks spent poring over a dictionary doing). So when I was wandering the stacks at Portland’s Powell’s books recently, I stopped dead in my tracks when I spotted the Dead Mountaineer’s Inn — in glorious English translation. I snapped it up and am so glad that I did. By way of background for those of you who are not familiar with Arkady and Boris Strugatsky, the brothers are iconic Soviet/Russian science fiction riders, their most well-known work being Roadside Picnic (also available in English now) which, incidentally, is not really at all like The Dead Mountaineer’s Inn. They grew up in Leningrad and were deeply affected by the siege of the city during WWII, as, frankly, were all Soviets. Boris stayed in Leningrad with his mother during the siege, but Arkady and his father left the city by train, headed to Vologda. When they reached their destination, Arkady was the only survivor on his railcar. The scars of war, inhumanity, and the impact of human kindness and connection clearly infuse their writing, this book being no exception. But in Dead Mountaineer’s Inn, the Strugatsky’s are having fun, with the reader and likely with each other as they wrote the book. It is absurdist comedy in the truest Russian sense. Borrowing from works like one of my favorites, Gogol’s The Nose (where a petit bureaucrat wakes up to discover he has turned into a giant nose), Dead Mountaineer’s Inn introduces us to detective Peter Glebsky. He descends upon the Inn, isolated in the mountains at the far back end of a narrow pass, where a mountaineer may or may not have recently died, and may or may not have left behind his Saint Bernard, Lel, who may or may not himself, the dog, be literate. Glebsky meets more strange characters — a magician and his neice/nephew, a scientist, a youth counselor with tuberculosis, a wealthy drunk recluse who may, or may not, beat his beautiful young wife with a whip, a giant Swede, a daft but alluring chambermaid/cook, and an innkeeper/inventor of perpetual motion machines. Glebsky is not a detective in the true, criminal investigator sense. Rather he is a detective the bureaucratic, paper-pushing, forged documents/counterfeit sense. Nevertheless, when the giant Swede ends up dead after an evening of dancing and card games, timed somewhat coincidentally with an avalanche that has cut off the Inn from civilization for at least several days, Glebsky reluctantly agrees to try to solve his murder. New guests appear, old guests disappear, and many of the Inn’s residents have meltdowns – including Glebsky. I’ve heard the book compared to a sort of farcical “Noises Off”, and while I can readily conjure up the images of Glebsky walking up and down hallways with doors opening and closing, and guests traipsing up and down stairways, the book isn’t quite as slapstick as “Noises Off”. Absurd to be sure though, and wryly funny as well. As science fiction writers, the Strugatsky’s embrace the unknown, and this theme resides in the Inn as well. Alek, the innkeeper, seeks out and embraces the unknown and urges Glebsky to do the same. When the mystery deepens, Alek hints at some knowledge but suggests to Glebsky that he is not ready to hear it. Glebsky doesn’t fight that notion, instead recognizing that he is in far, far over his head. Ultimately, Glebsky does solve the mystery, and the solution involves rival gangsters, love triangles and certain other intriguing plot twists that I won’t give away. If you are a fan of Russian absurdism, or just looking to try it out, add the Dead Mountaineer’s Inn to your list. Happy Reading!